There are a number of different types and grades of leather, each type being used for a different purpose, whether the leather is being used to cover a chair, make a handbag, a pair of shoes or a suitcase this versatile material needs to be cared for to safeguard its look and feel. Some types, due to their delicate nature require more care than others but overall the maintenance programme is similar for all. Good leather care can be compared to good skincare, in as much as you clean, moisturise and protect. Car leather: seats/door panels/steering wheels/gear shifts/dashboards etc. It is very important to ensure leather is cleaned at regular intervals, normally 2-4 times a year is adequate, although for lighter/paler shades more frequent leather cleaning may be required. Use Dynamix Deep Cleanse leather cleaner which is a versatile pH neutral leather cleaner that removes grime and dirt from all types of leather. It’s a gentle yet very effective leather cleaner safe to use on new leather as well as older leather. It’s deep leather cleaning properties ensures the safe and easy removal of all surface soiling and contamination leaving the leather spotlessly clean. Using Dynamix Deep Cleanse leather cleaner allows you to assess what areas may need recolouring or dyeing as it removes grime showing the true leather surface and finish. Now that the leather cleaning stage has been completed, it’s time to move onto the conditioning and protection of the leather. Conditioning or moisturising the leather is another important stage in the leather care programme. Similar to human skin, once leather has been cleaned is requires moisturising. 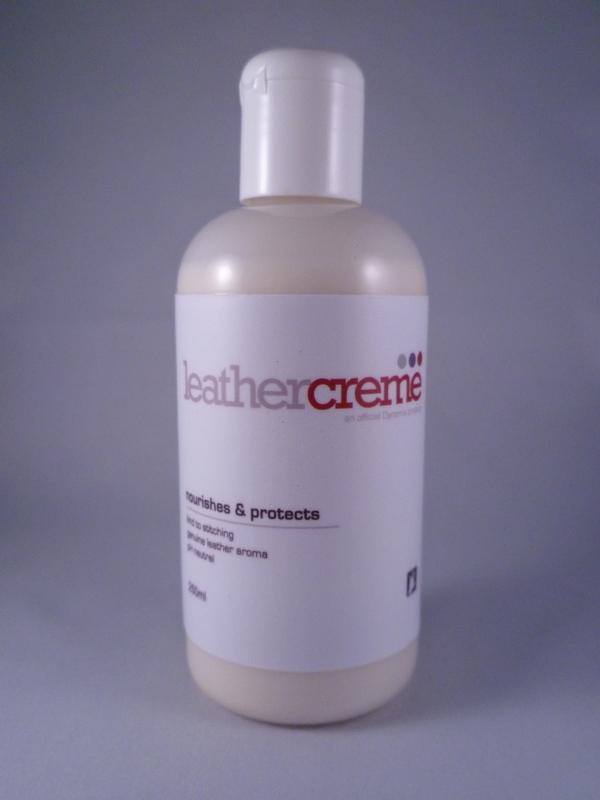 Dynamix Leather creme conditioner is a pH neutral crème based product which moisturises and protects the leather. It also adds a barrier of protection ensuring the leather fibres don’t dry out and become brittle. This barrier not only acts as a stain guard but minimises the wear of the leather by reducing friction of dirt and dust particles, which can abrade the leather surface. This leather conditioner replaces essential natural oils that evaporate and disappear over time and if they’re not replaced premature colour loss or abrasion can occur. A good leather conditioner should be absorbed by the leather and not sit on the surface or leave residue behind. Dynamix leather creme conditioner is fully absorbent and does not require buffing following application, you simply allow it be seep into the leather making it soft and supple. In the event of your leather being very dry, brittle & hard, we suggest using Dynamix Leather Revive which is an oil based emulsion which coats each fibre of the leather, literally bringing it back to life. The leather rejuvenator is often used to offset leather which is considered in a critical condition from cracking or splitting in the future. There is some information listed below, which we hope you will find useful in identifying what type of leather you own, whether it’s covering a handbag, car seat, motorcycle jacket or sofa these leather types vary greatly, as do the relevant treatment and repair of each. If you have any questions on this subject, or are unsure of how to treat your item of leather, please don’t hesitate to get in touch with us. There are a number of types available on the market today, and they vary greatly in terms of quality, type of finish and price on the retail market. The raw hide product is not in fact deemed to be leather until it has been subjected to the tanning process. The manufacturing process for leather varies with a wide range of methods used to produce the finished article. This is the most expensive type of leather you can buy today based on the number of hides available on the market today. It is the most natural looking leather with the unique surface characteristics of the animal hide remaining visible. Aniline leather is coloured only with dye and not with any surface coating of polymer and pigment. A light non-pigment surface coating may be applied to enhance its appearance and offer slight protection against spillages and soiling. A degree of natural unique marks and shade variation should be expected. This ensures that no two aniline hides are the same, each with it’s own history. Semi-aniline leather is more durable that aniline while still retaining a natural appearance. The increased durability is provided by the application of a light surface coating which contains a small amount of pigment. This ensures a more consistent colour and imparts some degree of extra protection. It also increases stain resistance. Pigmented leather is the most durable and is used in the majority of furniture upholstery. The durability is provided by a polymer surface coating which contains pigments. With modern technology the coating can be embossed (corrected grain) printed or plain. The surface coating allows a greater resistance to scuffing or fading making it more durable and hard wearing. It is also easy to maintain. This is a leather to which a special surface has been applied to mimic the unique ‘worn’ appearance of the more traditional leathers. This is achieved by the application of a contrasting top coat which is applied unevenly, or partially rubbed off, to reveal a paler colour beneath. There will be natural marks and some shade variation and this type of leather will age more over time. Also known as waxy or oily pull-up,has a natural worn look, which will lighten in colour when stretched. Pull-up leather will age and appear more ‘lived in’ with use. This leather may have some natural marks and shade variation. Its is very soft and delicate to the touch. NuBuck is a natural looking aniline dyed leather where the grain surface has been very lightly abraded to create a soft velvety finish or nap. The nap is very fine due to the tight fibres in the grain layers of the hide. In some cases the grain pattern is still visible. This product can easily soiled and is most appropriate for occasional use as it has no natural protective coating. Split leather is leather created from the fibrous part of the hide left once the top-grain has been separated from the hide. During the splitting operation, the top grain and drop split are separated horizontally.The drop split can be further split (thickness allowing) into a middle split and a flesh split. In very thick hides, the middle split can be separated into multiple layers until the thickness prevents further splitting. Split leather then has an artificial layer applied to the surface of the split and is embossed with a leather grain bycast leather. Splits are also used to create suede and the strongest suedes are usually made from grain splits (that have the grain completely removed) or from the flesh split that has been shaved to the correct thickness. Suede is “fuzzy” on both sides. Manufacturers use a variety of techniques to make suede from full-grain. A reversed suede is a grained leather that has been designed into the leather article with the grain facing away from the visible surface. It is not considered to be a true form of suede. For further information on our full product range & how Dynamix can rejuvinate your leather, please visit….